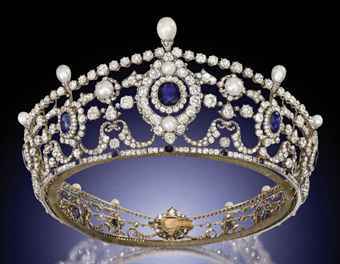 This tiara was made by E. Wolff & Co. for Garrard, the crown jewelers since 1843. It was made c. 1889, shortly after the marriage of the 6th Duke of Portland. Ivy, formerly the Marchioness of Titchfield, became the Duchess of Portland when she married the 7th Duke. There is a miniature portrait of her wearing this tiara, which required several pieces of family jewelry to be dismantled for its construction. It has 12 graduated sapphire and diamond clusters, a diamond-set openwork frame, button-shaped pearl and diamond borders, and pear-shaped pear finials. Sale price: 763,650 GBP, or $1,188,239 on Dec. 1, 2010.